Born and raised in Bride, it was only only after he had emigrated to New York that George Quarrie made his name in Manx dialect poetry. Quarrie was born as the eighth child at Ballavair, a farm in Bride, in around 1846. 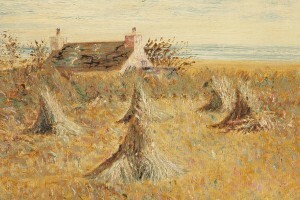 His early life in the traditional Manx farming community left a strong impression on him as he emigrated, first to England and then to New York. It was when abroad that Quarrie returned to a poem he had written as a teenager some thirty years earlier. This poem about the traditional Manx harvest celebrations, The Melliah, was published in 1880. Coming a year before the first of T. E. Brown’s Fo’c’s’le Yarns, and celebrating a traditional practice which at that time had already nearly died out, the poem was recognised as occupying an important place in both the cultural and literary history of the Isle of Man. The importance of the poem as a source of information and inspiration is seen most clearly in Hall Caine’s novel, The Manxman, which took great sections of its action from Quarrie’s poem. After Caine had ignored his request to acknowledge the reference, Quarrie published in the Manx press a detailed list of where the poem had been plagiarised. One happy consequence of this article was that it brought the poem back into print. Although Quarrie spent the last forty years of his life working as a journalist in New York, he continued to publish poems on Manx and wider British topics in the Manx press. These were to influence a younger generation of Manx poets, including P. W. Caine and W. Walter Gill, assuring his continued significance in the Isle of Man over nearly half a century. 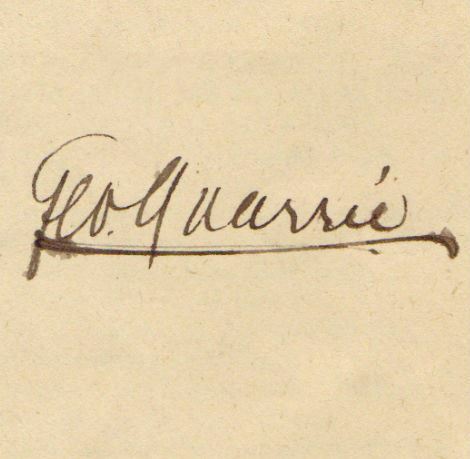 By the time of his death in New York at the age of 80 in August 1926, Quarrie had earned himself a permanent place in the history of Manx literature.